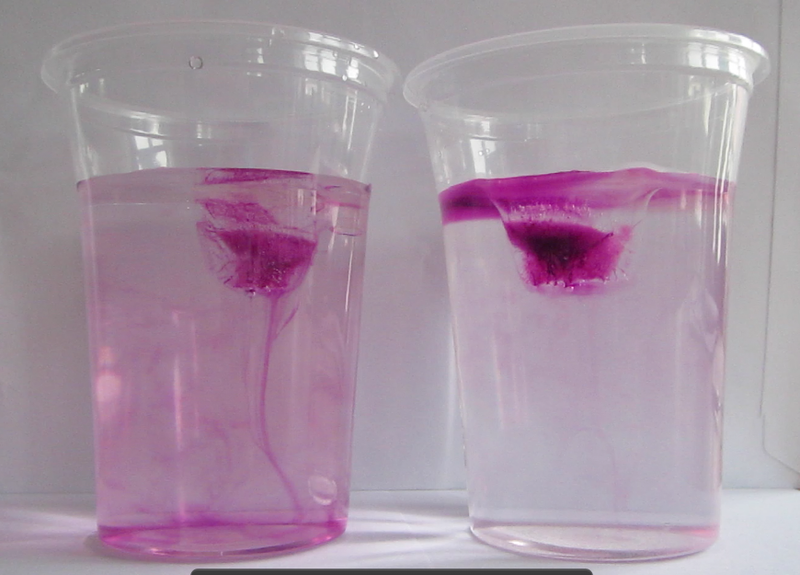 Experiment to visualize the effects of density differences on ocean circulation. This is the first post in a series on one of my favorite in-class experiments; I have so much to say about it that we’ll have to break it up into several posts. Post 1 (this post) will present one setup of the experiment, but no explanations yet. Post 2 will present how I use this experiment in GEOF130, including explanations. Post 4 will discuss different purposes this experiment can be used in (seriously – you can use it for anything! almost…). Ice cubes are added to cups filled with water at room temperature: fresh water on the left, salt water on the right. As the ice cubes start to melt, we can see the dyed melt water behaving very differently in fresh water and salt water. In fresh water, it quickly sinks to the bottom of the cup, whereas in salt water it forms a layer at the surface. 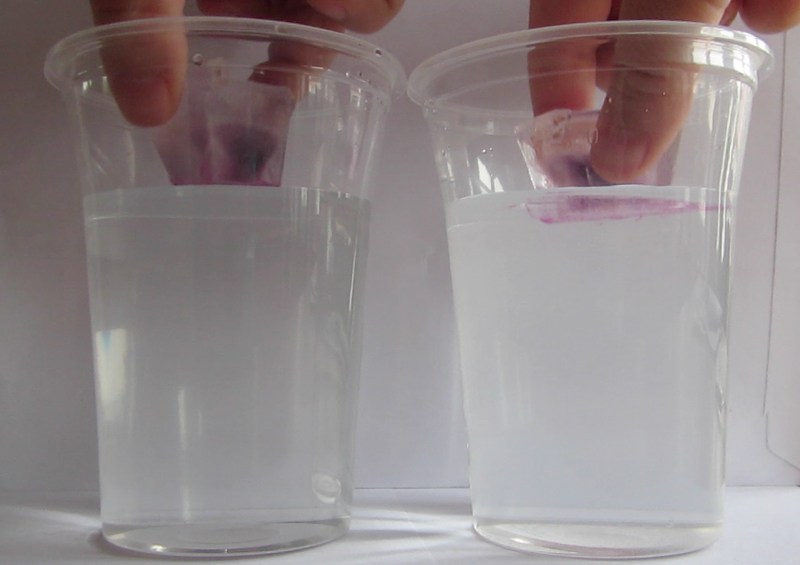 Melt water from the ice cube is sinking towards the bottom in the cup containing fresh water (on the left), but it is staying near the surface in the cup containing salt water (on the right). After approximately 10 minutes, the ice cube in freshwater has melted completely, whereas in salt water there are still remains of the ice cube. 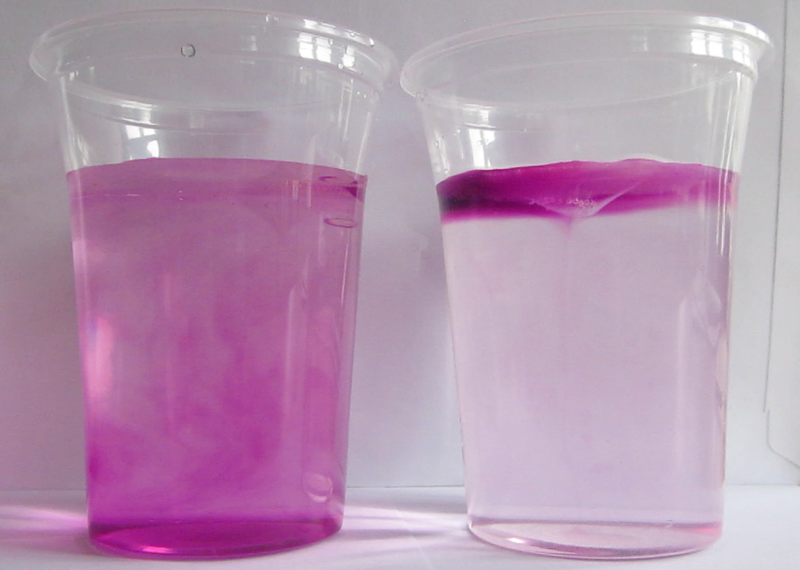 After 10 minutes, the ice cube in the fresh water cup has melted completely (left), whereas the one in the salt water cup is not gone completely yet (right). Why should one of the ice cubes melt so much faster than the other one, even though both cups contained water at the same (room) temperature? Many of you will know the answer to this, and others will be able to deduce it from the different colors of the water in the cups, but the rest of you will have to wait for an explanation until the next post on this topic – we will be doing this experiment in class on Tuesday and I can’t spoil the fun for the students by posting the answer today already! But if you want to watch a movie of the whole experiment: Here it is! 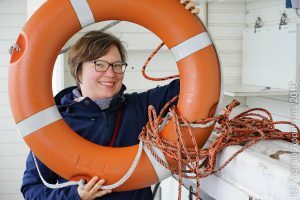 – I first saw this experiment at the 2012 Ocean Sciences meeting when Bob Chen of COSEE introduced it in a workshop “understanding how people learn”. COSEE has several instructions for this experiment online, for example here and here. My take on it in the “on the Cutting Edge – Professional Development for Geoscience Faculty” collection here. This entry was posted in demonstration (easy), hands-on activity (easy), kitchen oceanography and tagged density, hands-on activity, ice, kitchen oceanography, melting ice cubes experiment, oceanography, salinity, sea water, teaching, temperature on September 1, 2013 by mglessmer.